According to Samsung, the Galaxy Note 2 will be released in the US by the end of the year, though they didn't specify an exact date or even month. 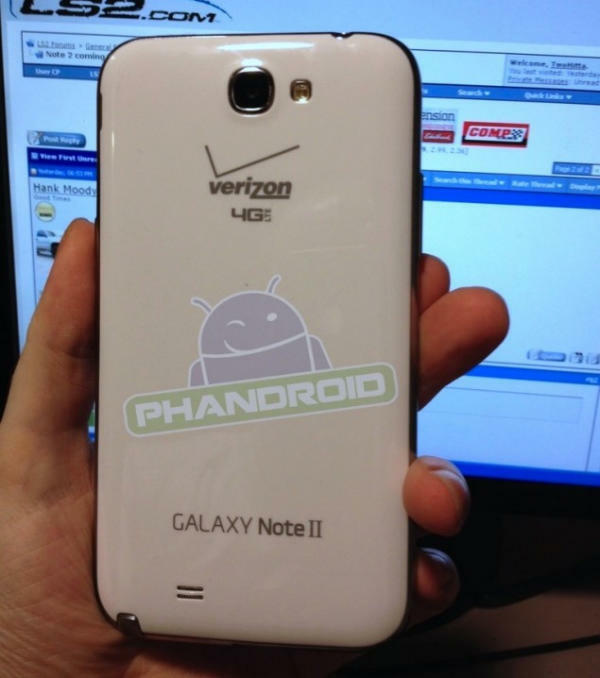 Now thanks to some leaks, we are able to see that the Verizon Galaxy Note 2 is ready and might hit the shelves very soon. We also know that Samsung's Galaxy Note 2 is heading to AT&T, Sprint, T-Mobile and US Cellullar pretty soon. It seems like the AT&T release date for the coolest phablet is October 21, according to Phandroid. What's weird about the leaked photos is that the Galaxy Note 2 has Verizon's branding both on the back and on the home button, something we didn't see before. While everyone was hoping that carriers will quit branding devices and filling them with bloatware, it seems like they are doing it even more now. Hopefully the leaks photos aren't real and Verizon will keep the device clean at least on the front side. Along with the fact that the carriers' bloatware only disturb the users, it also causes delays and that's why most Android smartphones reach Europe first. Most European carriers first release their devices clean. And I actually mean clean. During the first months after the release I always got Android smartphones from Orange and on contract without any branding on bloatware. After they finish their work on branding it and creating the bloatware, customers won't be so lucky. We should see soon what Verizon prepared us with the Galaxy Note 2, though it would be a wonderful decision to let the device clean. They would increase the client satisfaction a lot by doing it. If you didn't know already, the Galaxy Note 2 comes with a quad-core 1.6Ghz CPU, 2GB of RAM, 16Gb, 32GB or 64GB of internal memory, a 5.5-inch 720p Super AMOLED display and Android 4.1.1 Jelly Bean. All these make it a beast of a smartphone, being probably the most powerful one at the moment. Why does anyone care about Verizon branding? How does it affect your user experience?? Both the branding and bloatware can make some customers leave Verizon. I hate these things and I love it that Orange in Europe need up to six month to brand their devices, after they hit the shelves. Not the branding, the bloatware. It is the branding really...the Verizon logo seen on the home button, that many people are complaining about...that had people saying that they won't get it if it does come with the Verizon logo on the home button...its sad that those people will let something so petty affect their buying decision. What does it have for connectivity? HDMI? USB? Pogo Pins? microUSB and there's a microUSB to HDMI adapter.